Today, Starbucks (NASDAQ: SBUX) announced a suite of enhancements coming to its rapidly-growing Starbucks® Rewards™ loyalty program, bringing more than 16 million members flexibility and choice when redeeming Stars at Starbucks® stores. Beginning April 16, all members will be able to earn and redeem Stars for Rewards immediately after joining the program, bringing instant value to its growing fanbase. Members will continue to earn 2 Stars for every $1 spent when using a registered Starbucks Card for eligible purchases at Starbucks stores. These enhancements build on existing program benefits that will remain available to all members. In addition to earning 2 Stars for every $1 spent in Starbucks stores, members enjoy free brewed hot coffee & tea refills, a free birthday treat4 and exclusive personalized offers along with dozens of additional opportunities to earn Bonus Stars through monthly Double Star Days and more. 1 Tiered Rewards available at participating locations only. 3 Under the Starbucks Rewards Program, Stars earned do not expire as long as the member’s Starbucks® Rewards Visa® Prepaid Card or Starbucks® Rewards Visa® Credit Card account is open. If the member’s Starbucks® Rewards Visa® Prepaid Card account or Starbucks® Rewards Visa® Credit Card account is closed for any reason, Stars will expire six (6) months from the calendar month in which the account was closed. 4 To qualify for the Birthday Reward, a member must have made at least one Star-earning transaction using the member’s registered Starbucks Card. Since 1971, Starbucks Coffee Company has been committed to ethically sourcing and roasting high-quality arabica coffee. Today, with more than 28,000 stores around the globe, Starbucks is the premier roaster and retailer of specialty coffee in the world. 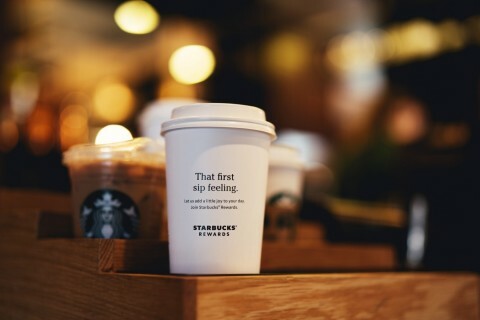 Through our unwavering commitment to excellence and our guiding principles, we bring the unique Starbucks Experience to life for every customer through every cup. To share in the experience, please visit our stores or online at news.starbucks.com and Starbucks.com.